restaurant above the Bundestag: Strains were clear at the once convivial event. "For all the diplomatic pleasantries and the cozy Bavarian hospitality, there is a topic this evening that angers and divides the camps … German rejection of sending weapons to Ukraine … Defense Minister Von der Leyen and Secretary Kerry greet each one another only in passing. While over the past year, despite the NSA affair, there were photos of a charmingly smiling Kerry and a beaming Minister von der Leyen, a frosty silence now reigns. A captured moment of the two standing beside one another never occurs. Nor do they exchange a single word at the table where von der Leyen sits just a seat away. … Dinner at the Käfer, the kick-off of the Munich Security Conference, used to be called the German-American Friendship Dinner. But this year, that seemed like a long time ago." At the most exclusive event of the Munich Security Conference, politicians and business leaders meet for a chat. Despite the cheerful atmosphere, though, one thing is palpable: The glacial atmosphere between two top politicians. This is a summit held behind-the-scenes, and is usually quite enjoyable: At the traditional dinner hosted by Linde AG CEO Wolfgang Büchel and lawyer Wolfgang Seybold at the Käfer restaurant, top politicians, the directors of the DAX, senior military personnel and defense experts meet one another in a relaxed atmosphere. As steak tartar canapés are being served, Siemens CEO Joe Kaeser, whose company only hours before announced massive job cuts, talks to former Minister-President of Bavaria Edmund Stoiber about global competition. “This is just as much a concern to Germans,” says Stoiber. Israeli Minister of Intelligence and International Relations Yuval Steinitz offers words of comfort to European Parliament President Martin Schulz on his controversial speech to the Knesset. Former Sweden Foreign Minister Carl Bildt is drinking a Rheingauer Riesling (“Germans make better wine than Swedes!”) with his former counterpart from Poland Radoslaw Sikorski. Wolfgang Porsche pushes past an American four-star general, E.ON CEO Johannes Teyssen and power couple Paul and Ann-Kristin Achleitner are in attendance (he, chairman of the Deutsche Bank supervisory board and she, a celebrated professor), as well as Development Minister Gerd Müller, UAE Foreign Minister Abdullah bin Zayed al Nahyan, and E.U. High Representative of Foreign Affairs and Security Policy Federica Mogherini. Yet for all the diplomatic pleasantries and the cozy Bavarian hospitality, there is a topic this evening that angers and divides the camps. It's the visit of Angela Merkel with President Vladimir Putin for which she has been sharply criticized by Senator John McCain. Just having her go to Moscow was a triumph for Putin, says an expert here. 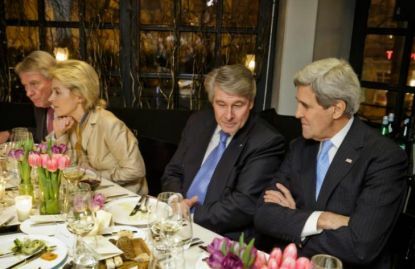 of State Madeleine Albright before getting the cold shoulder from John Kerry. 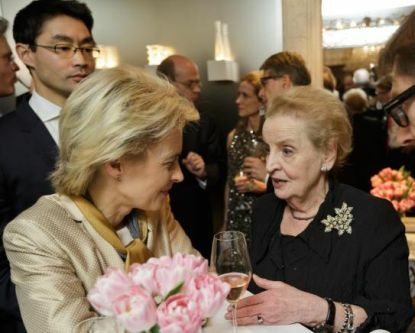 At any rate, Minister Leyen appears exceptionally tense when she appears at the dinner. When she joins former U.S. Secretary of State Madeleine Albright at a bar table, she must immediately here about everything the American didn’t like about her speech. 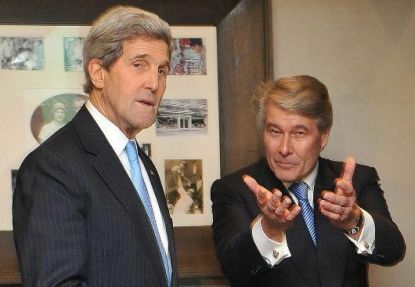 However, the transatlantic rift doesn’t become evident until John Kerry shows up an hour later. Von der Leyen and Kerry greet each one another only in passing. While over the past year, despite the NSA affair, there were photos of a charmingly smiling Kerry and a beaming Minister von der Leyen, a frosty silence now reigns. A captured moment of the two standing beside one another never occurs. Nor do they exchange a single word at the table where von der Leyen sits just a seat away. 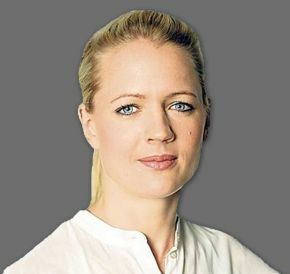 Instead, she remains so focused on her conversation with Deutsche Bank Chairman Paul Achleitner, who is seated opposite her, that it almost seems strained. Kerry chats with arms crossed with Linde CEO Büchele. Somehow this reminds one of the behavior of a newly-separated couple. as Kerry listens to Linde AG CEO Wolfgang Büchel. John Kerry wouldn’t be American if he hadn't brought along lots of optimism, despite the rather tense international situation. The Irish wild salmon has just been served when he assures his companions that it’s not all bad. Yes, these are times of change and challenge, but there are also positive developments. “The response to Ebola, for example,” said Kerry, "and AIDS in Africa was also significantly reduced." And for Putin, “Will he outlast us in Ukraine, or will we outlast him? I tell you, we can outlast him if we remember who we are.” The Transatlantic Alliance will show what its worth, he assures us. And, moreover, he could only praise the chancellor for her efforts. This is the absolute minimum in terms of diplomatic courtesy and in plain language means he doesn't think particularly much of Merkel's efforts. Dinner at the Käfer, the kick-off of the Munich Security Conference, used to be called the German-American Friendship Dinner. But this year, that seemed like a long time ago.